Mud. Dirt. Rocks. Multiplayer. Trucks. Customizations. Diesel swaps. Quads. Crawlers. SxS. Free. It goes on and on. 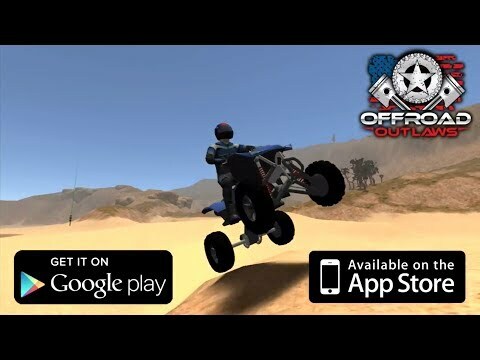 Stop reading, just download now!Offroad Outlaws gives you what you want in an off-road game: Complete control over how you build, setup, and drive your rig, tons of challenges to compl... see more Mud. Dirt. Rocks. Multiplayer. Trucks. Customizations. Diesel swaps. Quads. Crawlers. SxS. Free. It goes on and on. Stop reading, just download now! You build your rig the way you want it. You have total control over chassis setup - stiffness, damping, travel, etc... and can even swap to a different type of suspension if you want (want a modern truck with an I-Beam setup in front, and a solid axle in back? No problem.) For vehicle control you&apos;re given Tilt, Arrow, or on-screen Steering wheel controls. You choose! With several open world maps to choose from you can drive your rig slow across challenging rock routes, or fast over the flat sands of the desert. Want to take a break from the trails? Go play in the stunt park where you can use the ramps to "test" your rig&apos;s durability, or test your drivings skills in the Rock Park.